Sometimes my first instincts against something turn out to be limiting beliefs and my reluctant Yes – to a person, to an event, to an opportunity – was a game-changer, something I can’t imagine not having in my life. Other times, my Yes to something that seems like a natural fit should have been perhaps a No. The pursuit ends up sapping my energy, for perhaps an evening or for days or maybe for years. 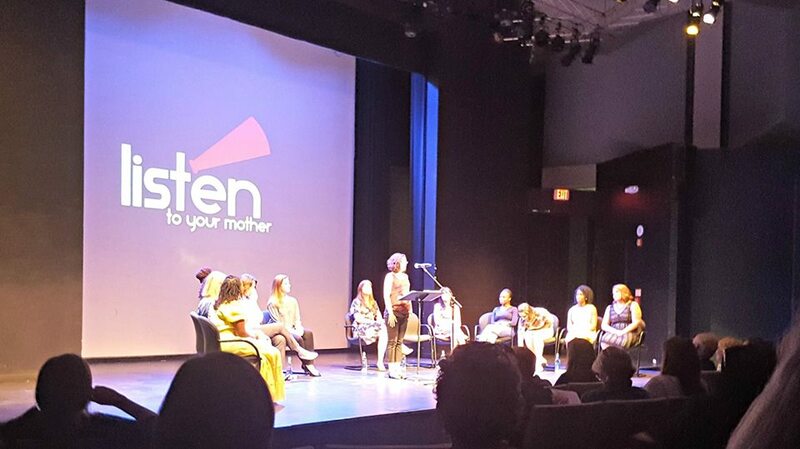 Last fall, I was exhausted from an emotional film I saw with my older child, but I persisted in going to a book reading I learned about from the producer of Listen to Your Mother (which twice told me No before telling me Yes in 2017). I said No to the drinks after the book reading, but since I said Yes to the event, I got to learn about an opportunity to submit a story for publication. But then Flood author Melissa Scholes Young said she might have room in her Grace in Darkness anthology, the eighth volume of the Grace and Gravity series of writing by D.C. Women Writers. Melissa, a professor at American University, had taken over the series from Richard Peabody of Paycock Press. “If you have something that fits the theme, I’ll take a look,” she said. So I switched gears. Instead of working on fitting the many parts of my novel together, I took pieces from several different chapters about one character and worked them into the a short story I wanted to exist about her. It was a long short story. Two kind friends read the behemoth and gave me helpful feedback before I sent it to Melissa, who was incredibly generous with her time. She understood what I was going for and offered terrific insights to help me get there. I learned a lot during the process that will serve the novel as a whole. I knew it was a smart Yes for me to try, even if the story didn’t ultimately fit into the collection. Then came time to talk about book readings. 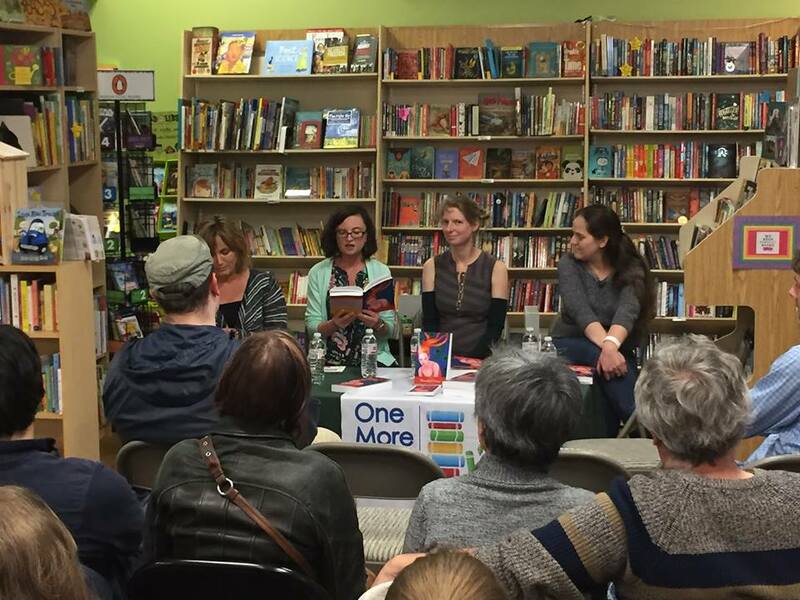 The previous year I’d been part of a reading at nearby One More Page Books & More for Abundant Grace, the seventh volume of the series where it was announced Melissa was taking on the series. It was less than a week after I’d been part of Listen to Your Mother, so it was a pretty busy time. I’d had some friends show up to that performance but there were lots who couldn’t make it. I hoped to have at least some folks at the book reading. I mean, it was my dream. 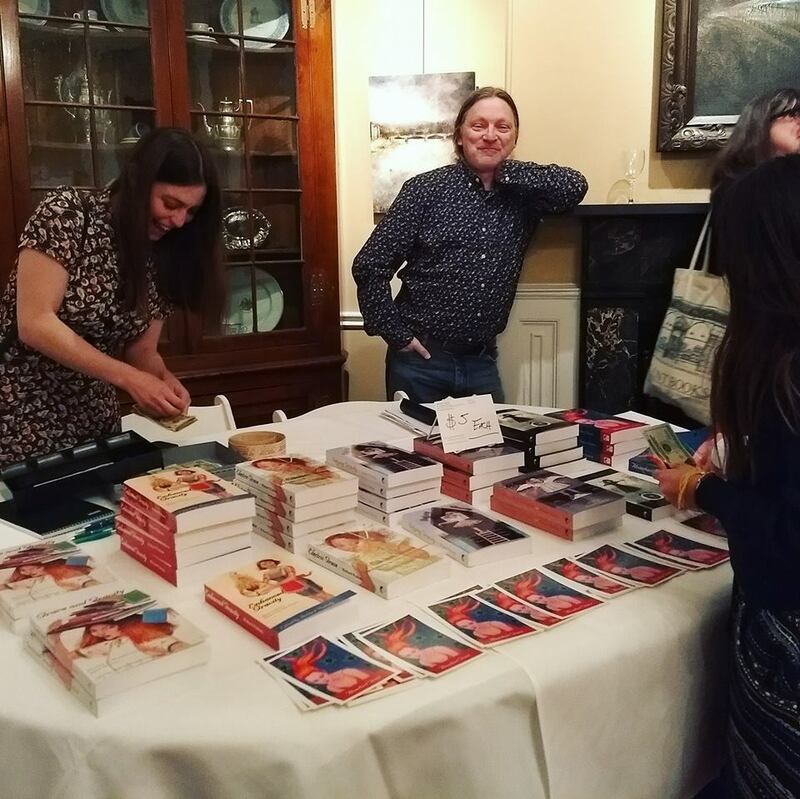 I was in a book reading! When I arrived, there happened to be two people I knew attending for other readers on the panel. Both were surprised to find out I wrote. After I had finished reading, I saw a friend who was also friends with another reader enter. Then one friend of mine came at the very end, when the Q&A was over. That was it. 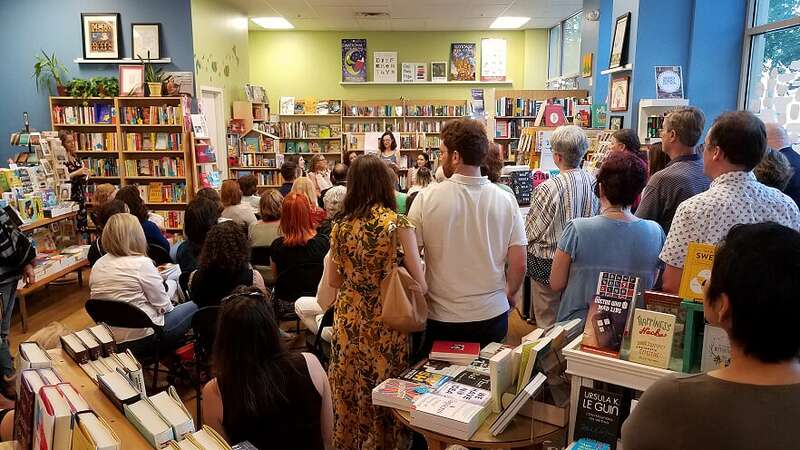 The room was full with folks seeing the other writers, but it felt like a flop to me, like no one said Yes to Jessica. Cue the pity party that lasted the better part of a year! Ahead of the publication of Grace in Darkness the following spring, Melissa asked us each where we wanted to read – and no, I didn’t have any other books to sell so it wasn’t going to be Politics & Prose! – I said I could fill in wherever if she needed a reader but otherwise I could sit it out. Then I said Yes to attending a reading that celebrated the whole series. 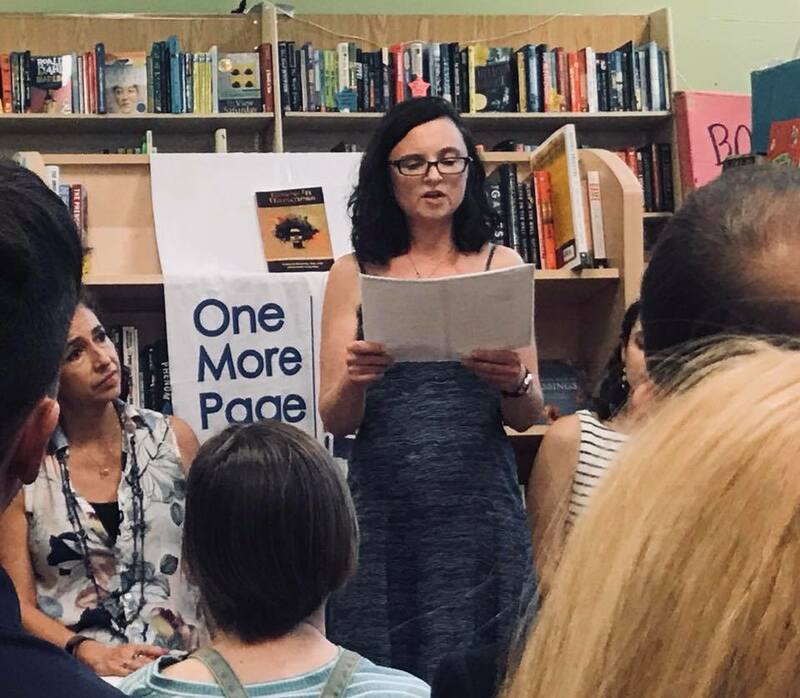 I was grateful to Richard for publishing my piece “Out of Scale” in Abundant Grace and to Melissa for picking up “Navigating” for Grace in Darkness and felt like if I expected other people to have shown up for my reading, I could at least show up for something celebrating my editors and other writers! She said my local One More Page had just said they were in to host. “It would be great if you could put that reading together,” she said. When it was beyond me, when it became an act of service for someone who had done a lot for me – and for others in our community – I was able to say Yes. It didn’t take a ton of work to assemble the six of us readers, but it was a little something, and Melissa was generous with her thanks. The event was packed, and it was a treat to look out and see several friends in the audience. My two kids and husband came. They videotaped my reading and heard me talk in the Q&A about something creative! My kids have heard me talk plenty about wellness advocacy but not about artistry. So there have been some good incidents of Yes. However, I’m at a point in my life of cataloguing and judging each time I said Yes, or No, or I Quit. My first I Quit came in eighth grade about singing in a speciality chorus, something that probably would have been healthy for me to continue, especially when my brother’s suicide happened five months later. I said I Quit in eleventh grade when a teacher I didn’t respect gave me a poor grade for an essay I knew was light years better than the papers of the seniors in the class, which had nothing of the rigor of my honors English classes in ninth and tenth grades. I didn’t need the credit, so I dropped the class to spend the time working more on the yearbook, which I had to pretty much take over the following year when our teacher’s son had a brain tumor and she disappeared for days and weeks at a time. That was a saying Yes at a time when I had also said Yes to the school play, and leading AFS and being vice-president of the Eco group. I should have said I Quit to some of those. Just yesterday I saw that the president of the Eco group got an amazing recognition for her art. I still feel bad about leaving her in the lurch but now also envious of her work and her success. My biggest I Quit/Yes was in 2005 when I decided I couldn’t teach anymore if I wanted to be healthy and if I wanted to have a family. I got pregnant and said Yes to family. But that was after I’d said No to the idea of quitting teaching to start some kind of freelance writing career. My husband didn’t understand, and rather than pursue an alternative career, I stayed focused on my health and what I knew. I planned to teach for one more year and got pregnant right before that started, securing my exit. I left a career I would don’t expect I’ll be able to return to. That left me at something like the zero yard line for establishing any kind of a career after having kids. And my health made me feel like I wasn’t even on the playing field. So I’ve done what I can as a volunteer – with Holistic Moms and in schools, places I can’t be fired or too much of a disappointment if I drop a ball. And I’ve approached my writing and website-building as something of an extension of my volunteer work. The quitting of teaching hurt, but I had a baby I hadn’t known would be possible to have. Then I gave the baby a sibling, and my body fell apart. I’ve continued to say Yes to things that I think will buoy me, but sometimes I’m wrong about what that will be. I’ve also said Yes to things I can’t do justice to. Some of that is because of my own ignorance, and some is because of developments in my health or my family’s health that I can’t control and sometimes don’t know how to navigate. I have avoided setting goals for a long time because everything feels like a moving target and like my eyes track changes in slow motion. I’ve been hearing for years from people, “It will get easier when your kids get older.” I completely disagree. Of course the more independent kids get, the more things they can do for themselves. Great. But the emotional load of parenting is getting harder, especially as my kids get closer to ages I remember more clearly, and with more pain. And I am getting older. I feel like I’ve aged decades in the past eight years. I’ve made improvements but had enough setbacks and I really don’t know what to expect in terms of energy or longevity. And certainly not about legacy. The women’s studies professor who encouraged me to say Yes to doing two master’s degrees in three years died of ovarian cancer (!) before I had completed one. She had a PhD and two nearly grown kids and several books and was probably just a little older than I am now. The doula who encouraged me on my journey to a homebirth after cesarean and who helped hundreds of women feel empowered as they birthed their babies took her life a year ago. She was I think a dozen years younger than me. I just found out that the English professor who was one of my greatest champions and helped me get into graduate school died of cancer several years after the death of her mother, whom she’d moved to take care of. I’m not sure how old she was, but I bet she was around my current age when she taught me. There are things I can’t not do for my children. There are things I can’t not do for myself. There are a lot of other things I don’t want to do anymore and thousands of things I feel I should have done or should be doing. I feel like fitting in what is necessary for physical health and mental health and parenting and just existing in the world is a giant game of Tetris, and I am terrible at Tetris. I’m not completely sure what shifts I’m going to make in the next few months, but they will likely be spent trying to figure out what will be the right balance of Yes, No, and I Quit.